My name is Mia and I’m ten years old. I’m the first person in my family to write a book. It’s called I Love You Natty and is about my younger sister who has Down’s syndrome. Natty is 7 and there isn’t anything particularly ‘special’ about her, but she does have an extra chromosome in every cell of her body, which looks like a jelly bean. She needs some extra help sometimes, for example I learnt Makaton to talk with my hands with her. She used to have physio therapy and also had surgery on her heart when she was small. But we all need support sometimes don’t we? Most of all Natty is just my little sister. I love that when she was small she would force herself to open her eyes to look at me because she recognised my voice. I love Natty and my life wouldn’t be the same without her. 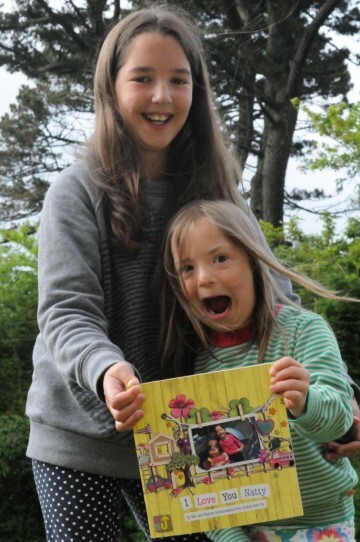 I wrote this book with Mum so that other children could understand what Down’s syndrome means. I did lots of drawings and we chose lots of family photographs to go in the book too. I hope you enjoy it. Natty does.